The Shoe Lab, Inc. specializes on shoe repair and shoe modifications. 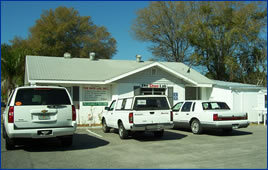 The Shoe Lab, Inc. is located in Ruskin, Florida where besides shoe repair we sell and fit comfort and orthopedic shoes. Our old fashion service, quality craftsmanship and large selection of fine quality footwear, materials and accessories are the key to our success. The Shoe Lab, Inc. stands behind its products and services while warranties all its work. We also have in our staff a license and certified Pedorthist. Members of our team have an extensive knowledge of footwear products, orthotics, shoe fitting and shoe manufacture. Our repair is of excellent quality. The Shoe Lab, Inc. is proud to say that local stores such as Nordstrom, Johnston & Murphy, Dillard’s and Couch had trust us to do their shoe repair. Many of our shoe repair clients come from different areas of the Tampa Bay Area and surround cities such as Sarasota, Clearwater, St. Petersburg and Orlando to bring their shoes to repair not to mention the fast turn around time. To serve not just our immediate community but also all the US, The Shoe Lab, Inc. developed this website so we can reach and help many more communities. We are not the traditional shoe store. We offer personalized service. Our shoes are mostly targeted to alleviate a specific foot problem or condition. We specialize in hard-to-fit patients. We can take any shoe and modify it to your need to accommodate any feet. We custom made shoes and bring any old shoe back to life. We can repair mostly any shoe! We look forward to continue servicing the community. We will keep abreast of the newest state of the art techniques while at the same time bring you the latest on shoe repair and comfortable shoes. The Shoe Lab, Inc. invites you to come in and visit us at our location in Ruskin, Florida to experience old-fashioned service and everyday commitment to customer satisfaction.